This stink bug was observed on Creosote Bush (Larrea tridentata) in the Goldfield Mountains, Maricopa Co., Arizona, Oct. 2008. Creosote Bush desert flats are among the harshest environments in North America. Survival means ‘eat what is available’ - i.e. creosote bush. And don't be eaten yourself. 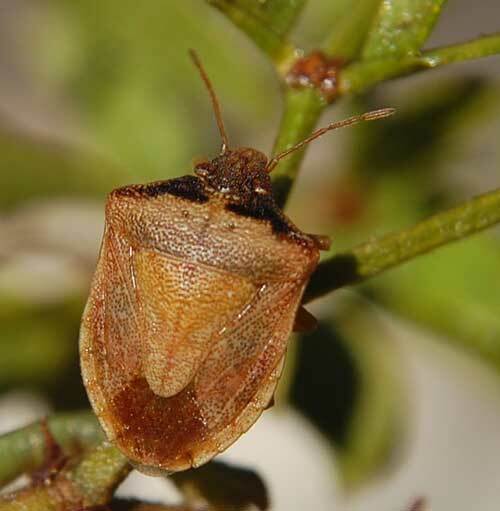 This stink bug does both well by taking on coloration similar to creosote bush within which it also lives feeding upon buds, seeds and tender shoots. The family name for stink bugs, Pentatomidae, refers to the roughly 5-sided plate called the scutellum. The scutellum is at top center of the bug. This bug, like all true bugs, has straw-like, piercing-sucking mouthparts for feeding strictly on liquefied food.